For as far back as I can remember, above my mother’s kitchen table, hangs the most charming framed “sketch” that I’ve ever seen.. and she created it. I have always been madly in love with it (despite numerous attempts, pleas, and batting my baby blues — my mother will not give it up — feel free to send me an email to forward onto her, begging her to bestow this upon her devoted daughter!) A fabulous house, a darling snowman, an otherwise just beautiful winter scene .. a sky full of lines, and patterns that just pull you in.. I sat and stared at this through every meal, wanting to walk right into this world. <sigh> Mom, if you’re reading this.. I really do want that picture, and I know what you’ll say… but I refuse to wait until you die, because quite frankly it’s not ever happening. You see, one of my fondest memories takes me through that wondrous time of being a small child, and lovingly gazing up at my mother, or grandmother as they spoke on the phone. I sat in utter amazement as they chit-chatted away .. (which was in my eyes, at the time, a seemingly very adult thing to do) all the while their hands with the aid of a simple pen made pure magic on a notebook, a pad of paper, a napkin, whatever was within reach — as they mindlessly doodled. It truly fascinated me, and I so, SO enjoyed the talent that they each possessed. 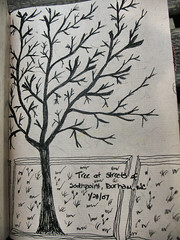 I was convinced (and frankly still am) that my mother’s creations (paintings & sketches as well) belonged in a museum. WOW! If these two talented women could mindlessly create such interesting scenes, textures, patterns, and beautiful lists .. imagine what would be if they set their minds to it. And boy, did i ever, want to be them. To posses their skill, their vision, and quite simply I wanted to be all grown-up too. (Oh the naivety of a child!) I began doodling everywhere, in the shower as the mist covered the stall … I attempted to doodle the lavish worlds I saw in my mind’s eye… On paper, I would scribble hoping to make some of that “magic” I saw within the two women I most admired. As i grew older, I kept notebooks filled with quotes, simple drawings, and shapes… (my bedroom walls also bore the grunt of this obsession) filled with abstract patterns and textures… and i would genuinely lose myself within the process. I LOVED that I had no boundaries. I absolutely loved that this was something just for me, that it wasn’t something I would be judged upon. This, was freedom. Somewhere along the line, I sadly lost that passion. Amidst all the to-do’s, responsibilities, and obligations we accumulate as adults I couldn’t justify a simple act that served no real purpose. Boy, was I ever wrong. 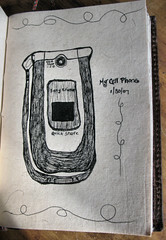 As 2007 rang in, I set a goal to give myself a much stronger, basic sense of sketching.. I am absolutely determined to lean how to draw. Going back to the basics, doodling, seemed the right beginning step. I grabbed one of my gorgeous journals, dropped it into my purse, along with some Faber Castell Pitt Artist Pens, and toted it everywhere I went. Doctor’s offices, the car, a coffee house, as I watch TV, wherever I have a few moments.. I doodle. I set aside time each week to sit down and sketch a tad more formally. I can honestly say, I am slowly seeing my once very poor drawing skills turn into a very raw, basic set of skills. Thrilling! However, it’s not the education I love, it’s the freedom that I have now reclaimed that resonates within my soul. C’mon, how often do we truly do something, that’s for ourselves, serves no purpose other then joy, and is an act that we will not be judged upon? It’s priceless. I reap the benefits anytime I create, in how I look at things, and I feel the difference internally. It’s amazing, how the simplest of acts, can free our minds so dramatically. 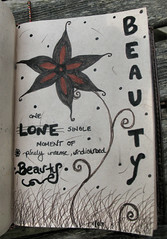 The photos throughout this post, are all pages within my doodle book.. I hope you enjoy them, as much as I enjoyed creating them. I can’t wait to look back at these a few years from now, and see how far I’ve come! Now it’s your turn, find your own freedom — get your doodle on, and if you are so inclined, drop by here.. and show me what you are doing! 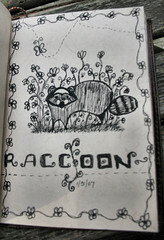 Did I mention, to get you going.. I’m hosting a Get your Doodle On ATC Swap? Sign up by leaving a comment on this blog post, and I’ll email you with the pertinent info. It’ll be a 6/5 swap (host keeps one card), all originals ( NO Copies!) .. Due in my Hands no later then 5/30/07 … Any theme, But needs to be a doodle, or sketch.. all levels of skill are welcome! Use sharpies, artist pens, markers, gel pens, pencil (seal it though), anything your heart desires! I would love to join this swap….what a great challenge!! I’d love to join this swap as well. As a small child, my single father (and in those days – the early 1950s, that was something – and I would play a game where one of us would draw a squiggle, and the other one had to make something out of it. It was a wonderful, creative game I played with my own kids when they were young too. 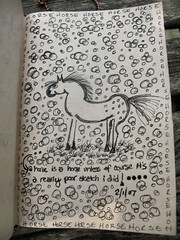 I’ve always doodled………. Thanks for hosting this swap! I think I would like to join in your doodle ATC! Another great idea! I also have an idea for you if you could email me, that would be great! Count me in! Love your doodles and have doodled since a wee one myself! My muse is excited by the work inspired by yours! ME PLEASE! 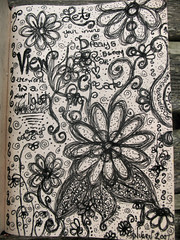 I love to get my doodle on! What an inspiring post. 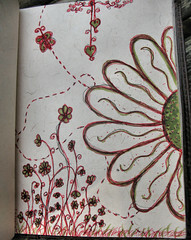 I cannot draw a straight line but I have also doodled forever usually the same stuff which I consider boring; swirls, rudimentary flowers etc. I don’t feel inclined to draw but I absolutely love doodles; if all levels are welcome including beginner doodlers, I would love to join in this swap; highly unusual and something I haven’t done before! I’m up for a doodle-a-thon if you have room. I have never been a great doodler but am up for the challenge. Hi everyone, thanks so much! I’m saving all your info, and will send out an email in a few days with all the info! It’s easiest to send it out after more folks sign up! This is such a great idea. Please sign me up. Thank you. My youngest daughter loves to draw & doodle all the time. Even though I try to keep her art in a folder it ends up in the trash bin. 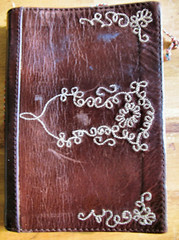 But if she draws in her own journal she will take better care of her art. Again thanks for the idea. I would like to join. Before I retired, I would doodle all over the desk pad calendar on my desk and one of the men that worked there would walk by when I wasn’t at my desk and write on the pad, “doodling again”. I wish I had kept those calendar sheets. 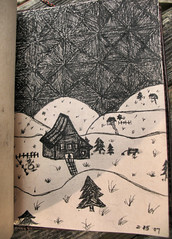 I am a doodler from way back. I love the idea of keeping a doodle book instead of an “artist’s journal.” I think I could feel far less inhibited if I knew it was just for doodling! 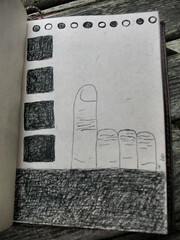 I have to start a new moleskine! I would love to join in the swap too! Hi! I found your Blog through the ATC flickr! site. I love your idea of doing Doodles for ATC’s!! Please count me in, I’d love to participate! 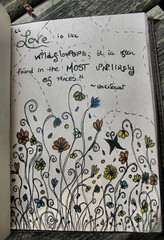 This is a fab idea, I love to doodle! I would be very interested in joining this swap, let me know if you still have room. By the way love the blog! Eee! I love doodling in my journal! And I’d love to join the swap! i’m sold, sign me up, please! thanks. sign me up! I am addicted to doodling! I will give it a try. Count me in! Count me in, I love doodling. Please include me in the exchange!! Neat idea…..I’m game! Sign me up, please. OK, I promised myself that I woldn’t sign up for more swaps…but this sounds like fun. I’m not a doodler but always wanted to. My Dad doodled while on the phone like your Mom and G’ma. Yahoo!! Sounds like a FUN FUN FUN ATC swap!!! I have to say that your blog entry with the all to YUMMY doodles has totally inspired me to do this more as well!! 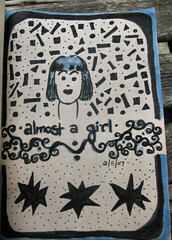 I’ve started so many journals for my art, musings etc. and I think I’m gonna try to dedicate one of them to doodles and drawing. Like you I used to do this all time, esp. on the phone or to keep myself awake during classes the whole time I was in highschool. I REALLY REALLY need to get myself going in this direction again!! THANKS for inspiring me!!! jude sent me over here & i’m oh so glad! count me in!!! my email is follow_your_bliss07@hotmail.com. I doodle all the time so would love to take part. I would love to take part in the swap if there is still space. I love your work it is totally awesome!!!! I love doodling and would love to participate in your swap…..please let me know what I need to do cause this is the first of my swaps with you. I’m in! I doodle in class when I’m not taking notes. It’s good to keep those hands busy!! I’ll join the doodle swap, please send me info. Thanks! Sadly, I can’t join the swap right now, but I did want to let you know how much I’ve enjoyed reading this story about your Mom, and for the reminder to just let loose and doodle for doodling’s sake alone! Your doodle journals look wonderful, and you’ve inspired me to take one of my many blank journals that are here, and designate it doodling-thank you! ** UPDATE! *** ** UPDATE! *** ** UPDATE! *** ** UPDATE! *** ** UPDATE! Everyone who has signed up to date, should have received an email from me with all the pertinent info — if you did NOT receive it…please let me know, and I’ll resend..it’s sent to the email address you used signing up here! P.S. This is still open — I’ll take as many people that are willing to play for this one:-) I just may swap some out sooner as they arrive in batches! I am not signing up for the swap, but I AM letting you know how beautiful your doodles are, and that you did indeed inspire me ~ so I posted about doodles on my blog today too. We are doodling in The Land of ZNE. Oooh, count me in Chrysty!! Judy Scott pointed me in your direction. Good to read this post. I love to doodle and a doodled set of ATC’s sounds terrific! Please put me down! Sounds like a GREAT idea!!! I think even I can whip out 6 doodled ATC’s by the end of May!! LOL Count me in! awsome doodles! I have always doodled and its nice to see it coming into it’s own. 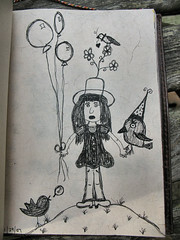 Please sign me up and my daughter Molly she’s a doodler too. I would love to be part of your Doodle swap. 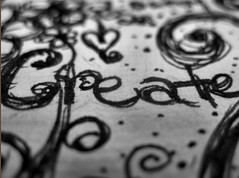 Getting my doodle on sounds like a great idea! I’m happy that you are on the road to recovery! 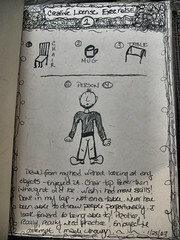 Thank you so much for that inspiring entry on doodling. I plan to start doing it today. What color of Pitt Artist pens do you use? WOW Chrysti!! Even your doodles are WONDERFUL!! Thanks so much for all the links…can’t wait to check them all out!! 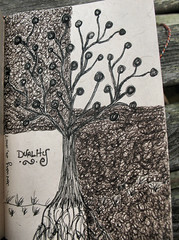 I would love to be in the doodle swap even though my doodling has never been much more than swiggles and crosshatching. This should inspire me to do something more interesting. Thanks for the opportunity. Ooh is there room for one more? I would love to join also. whoopee-doodle doo !.. count me in please ! What a wonderful picture you painted with your memories. I would love to join your swap. I too have always wanted to draw more than what currently looks like children’s drawings, so I too have been practicing. Thanks for all of the great links. Hello there! My friend Teri V. told me about your doodle ATC swap and I thought I would ask if I could join in. I can’t draw to save my life but I have doodled for as long as I can remember. If you could email me all the pertinent info I would be most grateful! I WOULD like to get to my doodle on!! Be Sure to check your spam folders! Yes ! Yes! Yes! Please include me in this swap. I have books and books and books of doodles I’ve done over the years. I think a swap with other doodlers would be very rewarding. Thank you for the invitation to be a part of it. and it comes t just the right time. i often try to get go and just doodle… mindlessly like you said. often my thinking gets in the way. this post and these images were very very inspiring!! i jsut read the section on the ATC swap, i’d love to participate, could you send me the details? i sketch a lot. but like you, i’m only discovering and developing my skills.danny gregory at http://www.everydaymatters.com has a lot of inspiration for drawing everyday. you can see my sketches and drawings at my blog, WATERMARK. i wosh you luck in exploring and drawing!! I love to doodle too and have as long as I can remember but I believe you have out doodled me! I love your blog! WOW! Did you think you’d get this many responses? I’d love to try this if there’s room. I cannot sit through a meeting without doodling on every white space I see. Like the second post, my brother and I spent many hours doodling a few lines and then switching and finishing each others picture. Although I’m the “official” artist in the family, I still think his doodles were better. You’ve inspired me to try this, if there’s room. I loved your story, too. I’d love to be part of this doodle ATC swap! 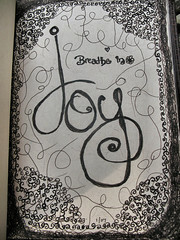 It’s one of my favorite things to do, I have to doodle a little every day, or the day just doesn’t go right!! This will be fun! NOTE: Be Sure to check your spam folders! Thanks so much! I’m thrilled at the turnout! Count me in. 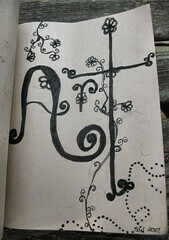 I love to doodle….please send me the information for this one. 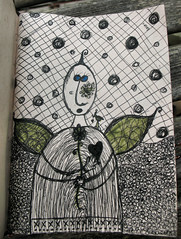 My virgin doodle swap :) – I discovered your work through one of the Yahoo Groups. I’m nervous as the first day of school, but very eager to try! I did a test doodle last night and hubby approved it so I’m going for it. Count me in. I’m sorry, but I will not be able to participate in this swap. Sounds like fun!!! I’d love to join your swap…..oodles of doodles, YEAH! hi……i read your post a few days ago…..and have been doodling ever since……you have inspired me! i’m going to start a blog…..keep up my doodle journal…and ….tra la la…..join your doodle swap….thanks for hosting it……. Wonderful post! I’d love to be in the swap….it will be my first ever trading cards…but far from the first doodle! I just got back from ArtFest and I feel all inspired. If you look at all of my notes from college and meetings and school days, you’ll find little doodles all over them. 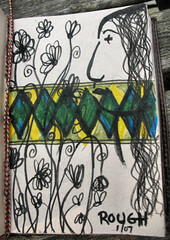 A Doodled ATC swap sounds like a wonderful idea! Sign me up! hmmm, what if my doodles are just that? I doodle while on hold on the phone mostly, but they are usually really random marks and lines and patterns, i don’t anything spefic… would those count? If so, I’love to be part of this swap… I was in one on swap bot, and we just doodled on an 8 1/2 x 11 piece of cardstock, then cut them into ATCs, and made sure we kept one for ourselves, when you put them in one sleeve, you have a great big mishmash doodle, very cool! it’ll be neat to trade outside my little e-worl box, lol! Note that the second word one begins with a zero, not an o! I would like to join the doodle swap. Sounds like fun! Are you overwhelmed! I had no idea there would be so many takers for this swap! I would like to participate. My email is mollyjhenson@yahoo.com. My doodles are in the mail …. picked up 1:30p.m. … mail moves on Sunday …. hope they see you monday or tuesday. If not the world will continue to spin. I had a blast exploring and i’m not finished i did have to take a break from focusing on one thing to make an ATC that included embellishment. In my mind that’s where the big winnings are – embellishments. Hi Chrysti, I hope I’m not too late. I was being a bit overwhelmed when you first announced this but am now interested in joining. My email is gwkburton@sasktel.net. Thanks to Jude for telling me about your swap. Hi Chrysti – I didn’t receive the email. I’d love to participate. It sounds like so much fun. 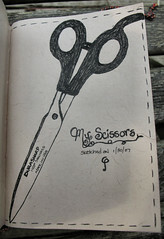 I’ve always been a doodler and I’ve been working with Traci Bautista’s collage book. I’ll wait for your email. id love to join in too! Hi, just wondering if you’ll be posting some of the doodle atc you receive? I’d love to see what everyone comes up with…maybe a flickr photo pool? 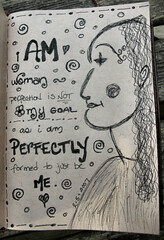 You are an AMAZING woman – I just found your site through ARtella and I am inspired to doodle a little more. Your blog is awesome. Thanks for inspiring me. I would love to do this …. I have never done an ATC swap before but I have enviously sat on the sidelines and looked at what others have done. I LOVE to doodle! And I’ve so far managed to create a acrd for almost everyone as a surprise! I am going for it and joining in with this project. The pressure is on and that’s what I need to get me started. Send me the details. Chrysti- I want to join the ATC Doodle swap please! I found your swap post by reading Gillian’s blog and had to immediately come see what it was about because I thought I was the only one who liked to do this crazy, mindless doodling! I have a little book I’ve been doing it in – mostly on top of gessoed pages and it has been so much fun and SOOOO relaxing! So glad to see there are others like me who like to do this! Thanks for hostessing! Please send me the info to participate. And I’ve so far managed to create a card for almost everyone as a surprise! Thank you, Chrysti, for your kindness and inspiring motion forward. 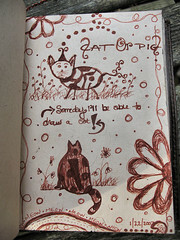 I have been dooodle stuck since i sent in my cards – waiting perhaps to see if they will be approved of. My bad. As soon as I had doodled my last doodle i went RUNNING straight back to what i know; punching holes and using glue sticks, etc. 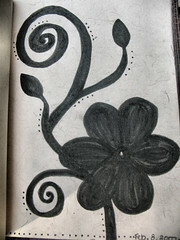 Hi Chrysti, I received the doodle instructions and am doodling away. I want to thank you for this opportunity to be part of a group who is willing to let us “artist wanna-be’s” into your artistic circle. I’m having fun finding my inner child, again. This opportunity to have fun came to me just when I was in the middle of a blue funk. You have lifted my spirits! Thanks! I have NOT received an e-mail from you and I really don’t know exactly how this swap works.Do we getassigned a swap partner(S) that we mail out our ATC’s to? What address do we send to? finally i figured out where this swap came from, LOL….i am glad that my atcs arrived safely. are they good enough for swapping? I would like to join too! I don’t usually doodle so this will be a new experience for me. It should be fun. I would like to join your ATC Doodle swap. 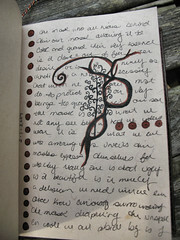 The work in your journal is beautiful! What a great idea. Hope I can incorporate it into my busy life. 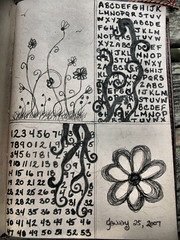 I love your doodle book pages and the Get Your Doodle On ATC Swap idea. I’m not an artist and I’ve never made an ATC so I don’t know if I’m qualified to join your swap. This is the first time I’ve visited your blog, but it won’t be the last. I love it. I have a few questions. Please email me. Thanks! Sign me up! I am so excited – I just might spend the afternoon dodling on the deck! You do NOT need to be a pro artist, or have any special skills for this folks..the idea, is to have fun! Hi! I never rec’d an email. Hey, Chrysti! I am authoring a book for Rockport tentatively titled 1,000 Artist Journal Pages…I need submissions. Have you submitted? I looked through what I have and didn’t see your e-mail, but I have quite a few, so I may have skipped over it…If you haven’t submitted, please go to my blog and download the submission guidelines on the left. Please let me know if you have submitted…Thanks! NOTE: USPS Increase will have gone into effect when i return these cards, and it’s a significant jump — Please include 1.25 in postage on your envies..thanks! Hi there I have my ATC’s done but still don’t have the info to send them to you. could you please send it again ? please!! You should be receiving mine any time!!! What fun!!! Mine are on their way to you! This was so much fun. I’ll also be extending the deadline, since an overwhelming number of folks requested it… it’s the only extension though! — June 9th, 2007.
thanks for the extension, however I have misplaced the email on the original instructions such as the details for returning our swapped cards to us. Mine are ready to go and I have the address. Would love to join in with your swap, I live in the UK so hopefully I’ll have time to post them to you… as regards postage back to me, we do have some dollars in the house (my husband travels on business…so we usually have various currencies to hand) or would you rather I sent you something from the UK? I am going to seal and mail mine today. NOTE: USPS Increase will have gone into effect when i return these cards, and it’s a significant jump — Please include 1.25 in postage on your envies..thanks! — I wish i could afford to cover all these personally, but i can’t — so please be sure to include correct amount! I want to participate,,,,is it too late? Oh, I just see it extended,,,please send me info….. yipee!! Hi Chrysti, My mail wouldn’t go through so I’m posting here. I’m still in. My husband had surgery on his neck (ruptured disk) so I haven’t gotten my cards in the mail yet, but they are complete. I’ll be sending them this week. Thanks. Another latecomer–I’d like to join this, too. still waiting for info,,, mine are ready to go, if you accept me into your swap….???? Hi Chrysti, I’m getting my cards in the mail Tues. a.m. Thanks again for hosting. I’m putting my cards in the mail tomorrow!! Sorry that they’re going to be a bit late!! I hope it’s not a problem!! IMPORTANT!!!!!!!! !NOTE: USPS Increase will have gone into effect when i return these cards, and it’s a significant jump — Please include 1.25 in postage on your envies..thanks! — I wish i could afford to cover all these personally, but i can’t — so please be sure to include correct amount! Mine are in the mail today! Thanks for getting me doodling again! It’s my Birthday Sunday (6/3) .. so I’ll be away sat, sun & mon… will update tuesday again! my cards have been ready to go, can you send me an email with your address so I can mail them! thanks!! Happy Bday young pup!! Happy Birthday! Hope your day was wonderful. 36.Tina Shoaga * Please contact me about postage, none included! 38.Anastasia Christoum* Please Email Me Your Address, No return Envelope in package –thanks for all the goodies! Chrysti, I think I’m still going to trade if the cost to overnight isn’t too steep…I put them on my blog and I’ve had fun making them…my first trading cards. I was wondering what was going on with the swap, I am glad I checked your blog, my questions have been answered! Due to the increase in postage costs, would you like me to send more postage? I know it’s the deadline, but better late than never! I can’t waituntil get them! I have sent emails to the remaing 20 people, to see if the cards have been sent yet, they have til friday to arrive! If you HAVE sent them already, please let me know! And I’ve managed to create a card for almost everyone as a surprise! Deadline is PASSED! Cards will be swapped on Friday, 6/15/07 to allow for the last few straggling in… any cards that arrive after that will be returned, or if i have enough leftover that i made, swapped out with me (if you choose). 43.Chelsae Youkers * Please email me your address, no addy on envelope! 46.lauren fraser * Please contact me about postage, & SASE none included! LOVE the envie you sent your card sin, and the card you included – TY! Chrysti, I can’t believe mine aren’t there yet! I mailed them on the 1st! I sent them through the regular mail as I thought there was enough time..lesson learned I guess! Hopefully they’ll show up by Friday…if not I’d still love to have one of your’s if you have enough. Thanks for organizing such a cool swap! Alright — Swapping day has come ( as has today’s mail) as of now… these are all the cards I have received! The cards that have been sent, but haven’t been received — if they turn up, I will email you, and figure otu what we can do — I made a ton of extra cards ( so many drop outs — so I have them left over) … and with the others straggling in, we may be able to swap em out ok. Plus, I will check tomorrow’s mail too. Gonna start swapping them out tonight.. with the first batch mailing out tomorrow — and will be blogging about the swpa in the next few weeks. 51.Norma Amador * Please contact me about postage, none included! This was so much fun! P.S. — if you blogged abotu thtese, shared photos of your card setc… please let me know — comment here, or an email… so I can include the link in the post! Oh — It will take me awhile to blog these — as i had made over 75 cards — it’ll take awhile to edit the scans of them all! Thanks for all your efforts in organizing this. You have been a wonderful host. I have already posted mine on my blog and you can link back or copy the pics from my post. PS good luck with the collage sheets & store! I’m gonna have to go shopping with you!! OH Chrysti!! What a whole lot of work this swap has created for you!! But I’m so proud of you for getting so much done so quickly!! Rushing like mad here — too much to do, not enough time.. I received my swaps today . What fun! Thanks a million for hosting this. I have never done a swap before and I think it’s wonderful so many people took part. Thanks for the the card you made as a gift. It is a hoot!! Norma Amador, Jonny Binkard, Elinor Stecker-Orel, Tricia Hutchinson, Susi Unupi, and, of course Christy for your card and all your hard work. I’ve been inspired and just created a 15 x 20 giant doodle and cut it up into cards. It was so much fun! I watercolored the background and only used black sharpie. I recommend it! It was totally addicting until I filled every space. A great swap. Got my doodles! It’s amazing how each one was so different than the others. Love them. Thanks for hosting and hope we can do this again sometime. Thank you so much for all your hard work. I got the Yellow envelope full of ATC’s yesterday. The whole experience was fun and the best part was how encouraging you were to people like myself, who feel scared to jump in. I did and it was a blessing to me!!!! I hope you have a productive day. I am going to buy a collage from your shop. Wow! What wonderful art arrived in the mail. I spent an hour just ooogling over everyone’s doodles and all of you are most talented! Christi – you just out did yourself and I’m so glad I participated. Thank you for your herculean effort and count me in if there is another! Thanks for arranging this swap… my doodles have arrived… I’ll post them soon on my blog… when I’ve got the camera back.. it’s gone on a school trip!!! Am concerned – did my envelope get held up for some reason? Your blog says they mailed on 6/16, but it is 6/28, late evening and still didn’t get them. It is only 2-3 days mail from you to Ohio….any ideas? Hooray! My envelope finally came! Postmarked June 16 and everything and it took 13 days to make it to make it ALL THE WAY from NC to OH! Who’d a ever guessed? I love my cards! Thank you so much Chrysti for hostessing this fun swap and for giving me your ATC as well! And to Jonny Binkard, Robin Orewiler, Sharon Sears, Nerissa Alford, Linda Phillips, Jennifer Griffin, Samantha Harding, Joyce Cole, Kristin Chadwick and Susi Unupi for your doodles! It’s nice to know there are others out there who are addicted to doodling like I am! I received my Doodle ATCs this morning in the UK. They are all lovely. I am so pleased with them. They are like mini works of abstract art and deserve to be shown off. Thanks to everyone for taking part and to Chrysti for hosting. It was great fun. I would just like to say that I have been enthralled by your blog and doodles, I found it because it was mentioned by a lady who had been inspired by you in the Creative Cards Yahoo Group. Very captivating. 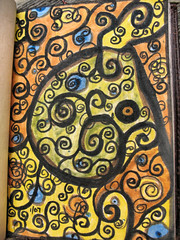 Abstract form of doodling and artistic. Just wondering if my atcs ever showed up…they never made their way back to me :( Thanks for any update you might have. I see a flickr photo not available sign on the post. I am looking for a doodle artist to help me create some images for my website. I have a scented candle shop named Flaming Queen. The name is cheeky and I want my homepage to reflect that. I wish I have talent to draw, but I don’t. So I am calling artists out there and see if we can work together. Please email me at chichink@mac.com. Hi, what blog platform is this? Is it working for you or..? I would really like it if you could answer this question! Thanks!